The Dark Knight Rises is a film based on the DC comics character Batman. 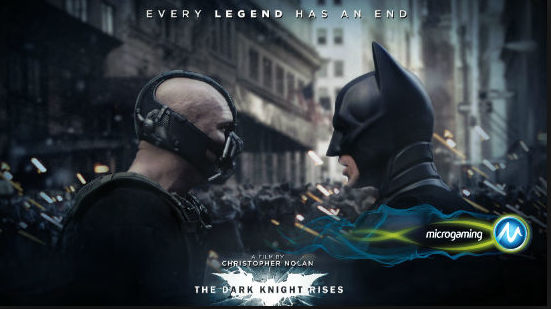 It is a sequel of Batman Begins and The Dark Knight – the third film of the Batman Trilogy by Nolan. The Dark Knight is a story is set eight years after the events of Harvey Dent’s Death. Dent’s Act had empowered Gotham’s police department such that it almost eradicated organized crime. Batman had gone underground; Bruce Wayne had become a hermit, and Wayne Enterprise was on the verge of collapse following the discontinuation of the fusion reactor. The Dark Knight Rises is a five-reel and 243-ways-to-win game developed by Microgaming. The game features characters from the film and even some screen grabs from the actual film. The symbols in use are real and in high resolution. The game screen features soundtrack from the actual game and in some instance; you are treated to a scene of Bane and Blackman fighting. The symbols on the reels are also lively with some short clips acting as symbols. The game has a flexible betting level with the ability to play from as little as 30 cents to a high of $20 a spin. Although the game is not part of any progressive jackpot (it should have been) it has some great payouts that will make it predecessor jealous. In this feature, all the symbols on an active game screen move around in different positions to give you massive winning combinations. In this feature, the wild symbol becomes an expanding wild on the third reel increasing your chances of a winning combo. In this bonus feature, you are given a random number of free spins and multipliers. Then Bane and Batman fight each other to award you a random multiplier and free spins. This is then added to the tally of the free spins awarded in the free spin bonus feature the next time you activate it. This bonus round is activated when you land three of more scatter symbols on any point on the reels. The scatters reward with free spins. You are first ushered to play of the two bonus rounds when you can choose between Bane and Batman. When you pick Bane, you will play using the Rolling Reels feature where you have a winning combo, the winning character explodes and its place taken by characters above it. New characters drop in on the reels meaning you can trigger wins even without the reels rolling. If you pick Batman, you activate the Extra Wild Blast. In this feature, you choose a second symbol that will play wild. The wilds in the game are stacked and heating-seeking. Due to the extra wild, you can have six-of-a-kind wilds that pay out handsomely.